The Phelps Auto Company manufactured cars in their factory at Pine and Tidd Streets from 1902 to 1905. 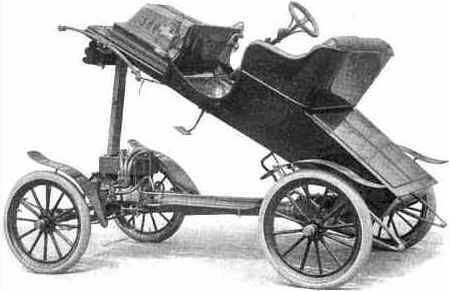 The 1903 Phelps Runabout (seen in the photo) allowed owners to completely lift the chassis off the frame in order to make repairs - a unique feature then and now. The cars were sold from a showroom in Boston. Phelps' cars gained notice for their quality (one set a hill-climbing record on Commonwealth Avenue in Boston), but the company folded after its owner decided to retire in 1905. Phelps was replaced in their factory space by the Shawmut Motor Company in November of 1905. Its Model 6, which featured a 4-cylinder 45 horsepower engine and a wood and aluminum body, cost $4750, which was 4-5 times most workers' yearly salary. A less elaborate 40 hp touring car was a bargain at only $3500. Shawmut cars were beginning to gain serious recognition when tragedy struck and a fire completely destroyed the factory in 1908. 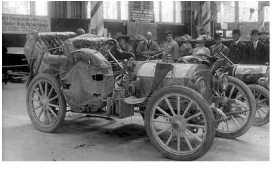 The car is shown just before the start of the race with T. Arthur Pettengill at the wheel. Beside him is Earle Chapin of Reading, who owned Chapin’s Garage at Elm and Main. Seated in the rear is Superintendent F. A. Meier of the Shawmut Motor Company. 1908 Shawmut Touring Car - Winner of the 1909 Pan Pacific Race from New York to Seattle. Built by the Shawmut Motor Company, Stoneham, MA (1905-1909). ﻿Not all the Shawmut cars burned in the factory fire, and the company decided to enter one of those spared, a 1908 touring car, in the 4,000 mile Pan Pacific race from New York to Seattle in 1909. It was the first transcontinental race in the US. 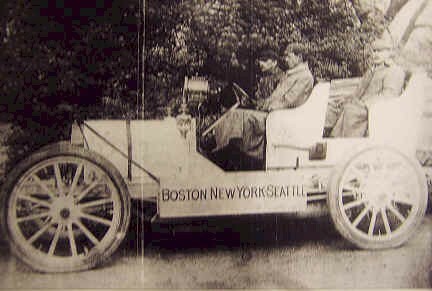 The Shawmut, driven by local auto dealer Arthur Pettengill, entered Seattle just after one of the entries from Ford Motor Company. It was later discovered, however, that Ford had violated race rules by replacing the engine in their car partway through the race. Several months later, the race organizers stripped Ford of the winner's title, awarding it instead to the Shawmut. Sadly, the vindication was too little too late. Ford had already gotten the publicity Shawmut Motors needed. Shawmut could not afford to rebuild the factory and ceased operations after the race.